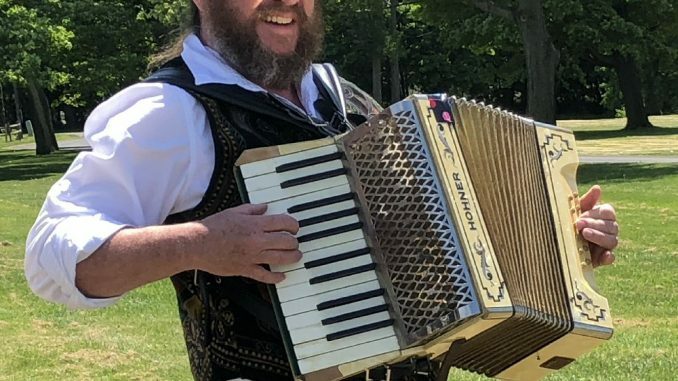 Accordionist Larry Rapshaw brings music to the children's parade at Fort Ontario June 1 at the third annual Madeline Festival. The event celebrates the beloved children's book character Madeline and includes children's crafts and games, puppets, kite-flying, a children's parade, skits, book-readings and other activities. OSWEGO – The beloved children’s book character Madeline and her real-life connection to Oswego will be celebrated June 1 at the Madeline Festival at Fort Ontario. 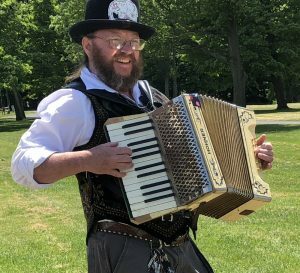 Accordionist Larry Rapshaw brings music to the children’s parade at Fort Ontario June 1 at the third annual Madeline Festival. The event celebrates the beloved children’s book character Madeline and includes children’s crafts and games, puppets, kite-flying, a children’s parade, skits, book-readings and other activities. The festival takes place from 10 a.m. to 3 p.m. on the Fort Ontario grounds and at the nearby Oswego Civic Arts Center at the end of East Fourth Street. Ludwig Bemelmans, author of the popular children’s books about a little girl named Madeline, served as a private in the U.S. Army and was stationed at Fort Ontario in 1917. He published his first Madeline book in 1939. There will be free admission to the fort, sponsored by Friends of Fort Ontario. The Oswego Art Association will offer kite-making, Madeline hat decorating, crafts with carnival animals and other Madeline-themed projects. Children are encouraged to dress as their favorite Ludwig Bemelmans character from the Madeline books. Marionette Magic will also offer an additional activity for children to make and keep a puppet. 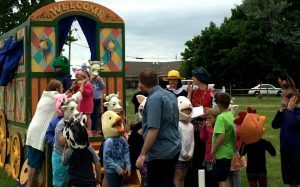 Marionette Magic will bring its gypsy wagon stage to the Madeline Festival June 1 at Fort Ontario. Pictured are children and characters getting ready to present the interactive children’s play “Madeline and the Gypsies” at last year’s festival. The Oswego Bookmobile will be on hand to distribute children’s books. Weather permitting, members of the New York Kite Enthusiasts will fly their colorful and unique kites in the skies over Fort Ontario. Kite experts and noted kite historian Thom Shanken will assist kite fliers of all ages and skill levels. For younger children, a small inexpensive paper kite will be available to decorate and purchase at the Arts Center. Kites will also be available for purchase from a vendor at the fort. For information about the festival, call Fort Ontario State Historic Site at 315-343-4711 or visit http://historicfortontario.com/event/bemelmans-festival/. For Oswego County visitor information, call 1-800-248-4386 (1-800-248-4FUN) or go to www.visitoswegocounty.com.